OK, I figure your tired of Yellowstone pictures so back to weekly travels. Although I may put up one more page of snowmobile pictures. 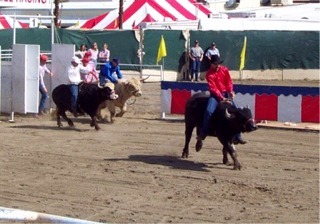 This is the Riverside county fair and National Date Festival in Indio. We were there on February 15th this year. They had pig racing but we missed it. The couldn't bring the Ostrich and some of the other birds this year due to the Newcastle disease going on. So, they had other odd animals for racing. This guy is a water buffalo. But here they are racing them. They sure were interesting to watch. The Date Festival had many of the things the normal county fair would have back east but they had an outfit called Hedricks Exotic Animal farm from Hutchinson Kansas provide animals for racing. 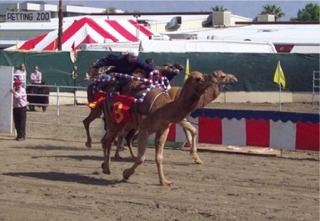 They did have camels racing this year also. They can really surprise you at how fast they can run. It was getting pretty hot and I didn't bring a hat so we didn't stay around too long. I didn't want to get sun burn. Uh Oh.. watch out there are dinosaurs on the loose roaming in Cabazon. 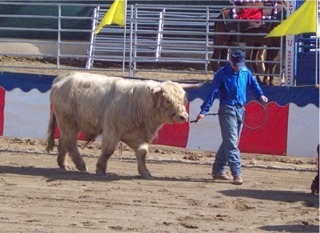 This is Dinny and he is one of two built by Claude Belle. Claude ran the Wheel Inn off I10 in Cabazon and built the dinosaurs as a tourist draw. Dinny took 11 years to build and has a souvenir shop in his belly. This hungry looking fellow was nearing completion when Claude died. It was never completed and they say it never will. They do have a fairly fresh coat of paint and look pretty good.